Letters and Papers, Foreign and Domestic, Henry VIII, Volume 1, 1509-1514. Originally published by His Majesty's Stationery Office, London, 1920. Eagle, bailly of the (bajulus aquil), of the Order of Rhodes, 438 (2 m. 6), 1765. See Newport, Sir T.
Eakring (Ekryng, Acren, Akryng), Notts, 438 (1 m. 6), 438 (2 m. 26). Ealing (Elyng), Midd., 438 (3 m. 19). Eambeth, John, alias Bofet, q.v. Eardington (Yerdington), Salop, g. 2137 (22). Eardisland (Greslame, or Gresland, Erysland), Heref., 438 (3 m. 17):g. 519 (64), 3107 (48). Eardisley (Erdyley, Yerdesley), Heref., 438 (3 m. 2). Earl's Crome (Erlescrombe), Worc., g. 1524 (47). Earlstone (Erleston), Hants, 438 (4 m. 24). Earsham (Hersham), Norf., rector of, 438 (2 m. 30). Easebourne (Eseborn), Suss., 1803 (2 m. 1). Easingwold (Esyngwold), Yorks, g. 563 (10). Easingwold or Esyngwold, John, p. 1505. -, -, Margaret, prioress of Wilberfoss, g. 158 (32). Easling (Islyng), Kent, 438 (3 m. 31). Eastbourne (Estborn), Suss., g. 132 (51). Eastburn (Estbourn), Yorks, 438 (4 m. 5). Eastchurch (Estchurch), in Sheppey, Kent, 438 (4 m. 2). Easter, Good- (Goodester), Essex, 438 (3 mm. 3, 30). Easterford (Esterford), Essex, 438 (4 m. 5). 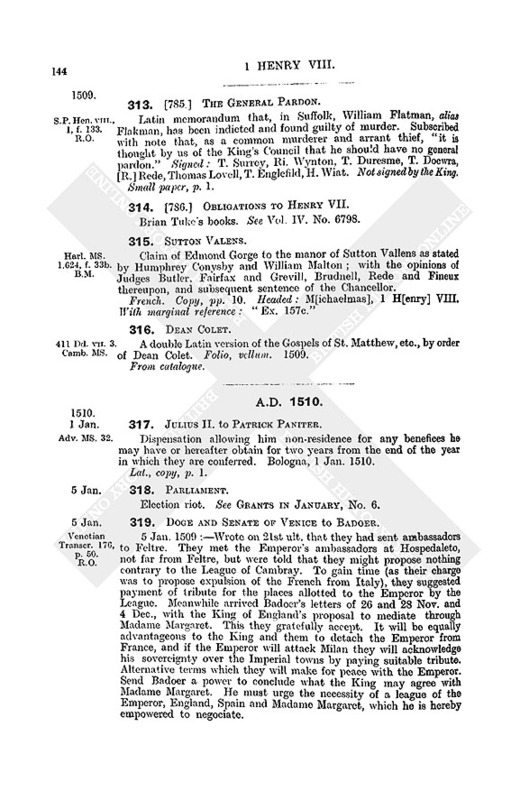 Easterlings, the, 20 (p. 20), 1370, 1567, 2694, 2832 iii., vi.:App. 14. Eastern Circuit. See Norfolk Circuit. East Friesland, lieutenant of. See Emden, count of. East Garston (Ergaston), Berks, vicar of, p. 1528. East Hall (Esthall), manor, Kent, 438 (3 m. 11):g. 3107 (23). Easthampstead, Berks, letter dated at, 533. -, -, grants dated at, g. 546 (65, 67, 712), 563 (16). Eastington (Estynton), Glouc., 438 (4 m. 14). Eastland (Estland, "eastward"), on the Baltic, 2809:pp. 1496 bis, 1497, 1503. East Mill (Estmyll), Hants, 438 (1 m. 12). Eastoft (Estoft, Estuft), Yorks, 438 (4 m. 6 bis). Eastoft (Estoft), John, 438 (4 m. 6). Easton (Eston), Cumb., 438 (4 m. 23). Easton (Eston), Hants, rector of, 438 (4 m. 1). Easton (Esten, Eston), Ntht., 438 (2 m. 30), 438 (3 m. 5):g. 218 (9). Easton (Eston), Suff., 438 (2 m. 13). Easton Bavent (Eston Davant), Suff., 1982 (4). Easton, Great (Estaynes ad Montem), Essex, 438 (3 m. 5). Easton, Little (Eyston ad Turrim), Essex, 438 (3 m. 24). Easton Neston (Estneston), Ntht., 438 (1 m. 24), 438 (2 m. 11):p. 1548:g. 804 (28), 1083 (41). Easton (Eston), John, 438 (2 m. 13), 438 (3 m. 20):p. 1505:g. 1732 (31), 2684 (110). -, - (Eston), John, purser, 2938 ii. -, - (Eyston, Eston), Th., 438 (1 m. 20). -, -, Wm., 438 (1 m. 20). East Riding (Estrydyng), archd. of. See Magnus, T.
-, -, archdeaconry of, 310, 438 (2 mm. 16, 32). East Thorpe (Esthorp), Essex, 438 (3 m. 11). Eastwell (Estwell), Leic., 438 (2 m. 4). Eastwick (Estwyke), Herts, 438 (4 mm. 5, 18), 3223:g. 2684 (1). Eastwood, Essex, 438 (4 m. 1). Eastwood (Estwode), Ric., 1803 (1 m. 3). Eatington (Etyngton), Warw., vicar of, 1803 (2 m. 4). Eatington (Etyngdon), Nether-, Warw., 438 (4 m. 27). Eaton Bray (Eyton), Beds, p. 1503. Eaton (Eton, Etton), Berks, g. 563 (8), 1083 (23). Eaton (Eyton), Bucks, g. 11 (10). Eaton (Ayton), Chesh. [in Tarporley], 438 (2 m. 8). Eaton Gamage (Eton G.), Heref., 438 (2 m. 27). Eaton Hastings (Water Eton), Berks, 438 (2 m. 23). Eaton Tregos (Eton Tregos), Heref. [in Foy], 438 (3 m. 12). Ebbingford, East-, Cornw. [in Stratton], 438 (4 m. 15). Ebony (Hebney, Hebbeney, Ebbeney), Kent, 438 (2 mm. 23, 24), 438 (3 m. 24). Ecclesfield (Egglesfeld), Yorks, 438 (4 m. 26). Eccles juxta Mare, Norf., 438 (2 m. 20). Eccleston, Lanc., g. 969 (38). Eccleston (Egilston), Gilbert, 438 (4 m. 5). Eche, John, 438 (2 m. 31). Echeham in Westfeld, Suss., 438 (2 m. 25). Echinghame or Echyngham. See Ichingham. Eckington (Ekyngton, Aginton), Worc., 438 (2 m. 17), 438 (4 mm. 20, 24). Edale (Edall), Derb., 438 (4 m. 21). Eddingthorpe (Edyngthorp), Norf., 1803 (2 mm. 6, 33). Edeirnion (Edernyon), co. Merioneth, g. 2861 (34). Eden, in Artois. See Hdin. Eden (Iden, Idon), Henry, 1803 (1 m. 6):g. 289 (34). -, - (Iden), Ric., clerk of the Council, 2053 (6 iii.):g. 1462 (26), 1662 (55). -, - (Iden), Th., g. 54 (25), 1083 (7). Eden Hall (Ednell), Cumb., 438 (2 m. 15):g. 132 (50). Edenham, Linc., g. 289 (13). Edenham (Edmayn, Edname), Dr. John, King's almoner, prb., and treasurer (July 1509) of St. Paul's, 19, 20 (pp. 11, 16, 18), 82 (p. 40), 438 (3 m. 29). Edgar (Eadgar), King, charters of, g. 447 (29), 519 (3), 546 (15), 750 (9). Edgbaston (Eggebaston), Warw., 438 (4 m. 11). 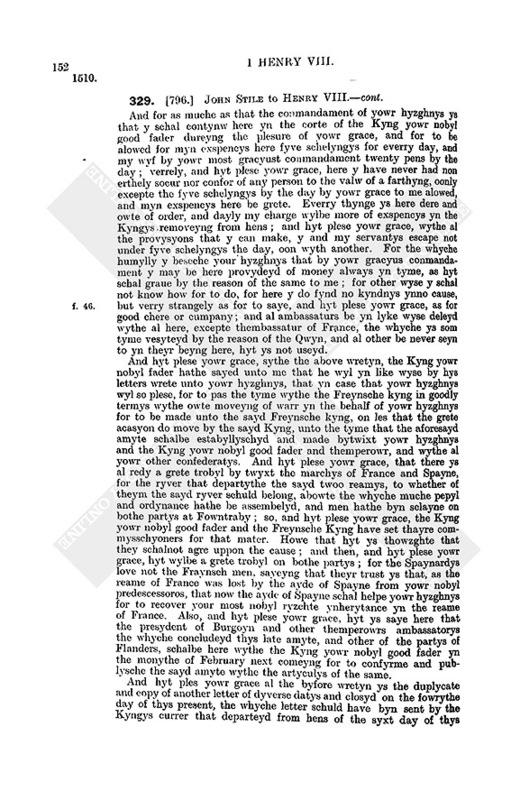 Edgecombe (Eggecomb), John, 438 (3 m. 6):p. 1542. -, - (Egecombe, Eggecombe, Echecombe), Sir Piers, knight for the Body, 420, 438 (4 m. 16), 1869 v., 1870, 1883, 2053 (7), 2305 ii., 2414, 2575 ii.:p. 1535 bis:g. 94 (846), 357 (10), 447 (24), 731 (44), 833 (58 iii. ), 1123 (22), 1221 (58), 1602 (38), 3049 (20), 3324 (42), 3582 (31). -, - (Egecombe), Peter, g. 1494 (9). -, - (Egecombe), Sir Ric., 438 (4 m. 16):g. 3582 (31). Edgecott (Egecote), Ntht., 438 (4 m. 9). Edgware (Egeware), Midd., p. 1515. Ediall (Edyall), Staff., 438 (2 m. 7), 438 (3 m. 6). Ediall, Henry, archd. of Rochester, &c., 438 (3 m. 2). Edinburgh, 584, 1262, 1314, 1504, 1645 (p. 742), 1735, 1775, 2161, 3481. -, -, letters dated at, 12, 107, 114, 233, 252, 281, 297, 302, 356, 3745, 422, 502, 539, 548, 588, 593, 598, 600, 655, 664, 666, 6848, 690 (2), 694, 697, 701 (3), 702, 773A., 810, 828, 836, 843 (2), 974, 1009, 1017, 10301, 1039, 1041, 1058, 10613, 1077, 1084, 1089, 1108 (2), 11101, 11167, 1136, 11513, 126970, 1287, 12941300, 1324, 1331, 1340, 13479, 1433, 1466, 1499, 1523, 1538, 15634, 1585, 161520, 1757, 1773, 17756, 1922, 20845, 2122, 2407, 2553, 3188, 33901, 3589. -, - Castle, 212n., 1645, 1775. -, -, Holyrood Abbey and Palace, 1084, 1775, 1983, 3119. -, -, -, letters dated at, 69, 129, 1100, 1109. -, -, -, George abbot of. See Crichton. Edingdon (Edyndon), Wilts, house of, 438 (3 m. 27). -, -, -, confirmation for, g. 1221 (31). -, -, -, rector. See St. John, J.
Edingworth [in East Brent], Soms., g. 132 (96). Edith Weston (Edeweston), Rutl., 1803 (1 m. 6). Edlingham (Edlingeham), Nthld., g. 2863 (5). Edlogan, co. Monmouth, g. 54 (31). Edlyn, Rob., 20 (p. 17). Edlingham, Nthld., 438 (3 m. 8):g. 485 (26). Edmondson, Th., priest, g. 3499 (36). Edmonton (Edelmeton), Midd., 438 (2 m. 33), 438 (3 m. 28):g. 289 (13), 485 (5), 709 (22), 833 (43), 2055 (130). -, -, Claverings lands, g. 485 (5). Edmund, John, S.T.P., rector of Petworth, 438 (3 m. 2). Edmunde, , to be confessor to Princess Mary, 2656 (4). Edmundes, Wm., g. 604 (13). Edred (dred), King, grant of, g. 381 (79). Edsawe or Edshawe, Ric., g. 2055 (22), 3049 (21). Edward the Confessor, grants of, g. 381 (73), 414 (17, 37, 63), 447 (7, 29), 485 (55), 519 (3, 31), 682 (12, 43), 709 (4), 750 (9). Edward I., grants, &c., of, g. 381 (22. 64, 68, 71, 79, 81, 85, 87, 99, 1057), 414 (8, 18, 20, 224, 367, 41, 57, 634, 66, 70, 745), 447 (7, 22, 2830), 449 (8, 16), 485 (11, 17, 225, 278, 49, 556), 519 (3, 35, 38), 546 (9, 14, 15, 46, 53, 69), 604 (37), 632 (134, 27, 29, 36, 44, 49, 58, 82), 682 (15, 43), 709 (4, 11, 29, 40), 731 (4), 750 (8), 784 (15), 833 (7, 23), 969 (14), 1083 (33, 47), 1123 (33), 1221 (13, 57), 1316 (18), 1462 (24), 1494 (43), 1494 (50), 3049 (32), 3408 (30). 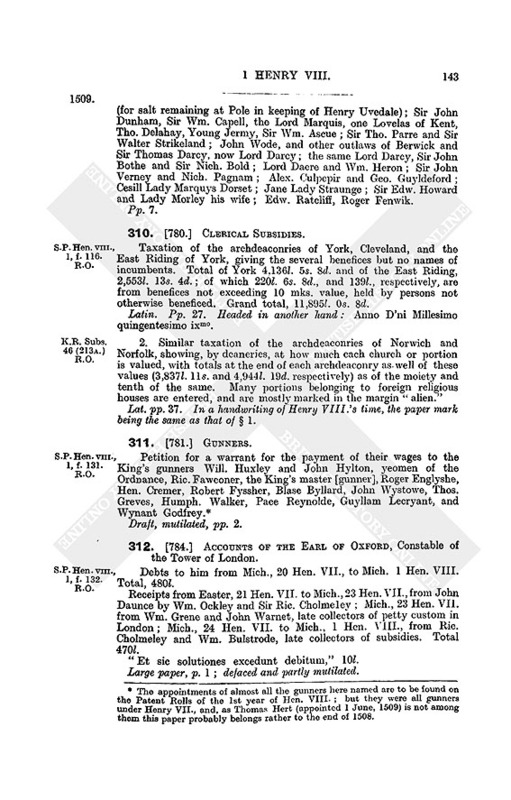 Edward II., grants of, g. 381 (7, 22, 27, 64, 68, 73, 81, 87, 923, 107), 414 (178, 20, 22, 37, 41, 57, 63, 656, 701, 745), 447 (7, 22, 32), 449 (8, 16), 485 (134, 17, 22, 245, 278, 456, 49, 55 p. 298, 56), 519 (3, 19, 28, 35, 38, 40, 45, 65), 546 (9, 11, 1315, 22, 46, 49, 534), 587 (3), 604 (3, 19, 38), 632 (14, 29, 36, 49, 58, 76, 82), 682 (12, 15, 31, 43), 709 (4, 8, 40), 731 (4), 750 (810), 885 (2), 969 (14, 57), 1003 (3), 1083 (33, 47), 1123 (33), 1221 (57), 1266 (2, 11, 37), 1316 (18, 23, 29), 1494 (50), 1804 (24), 3408 (30), 3499 (64). 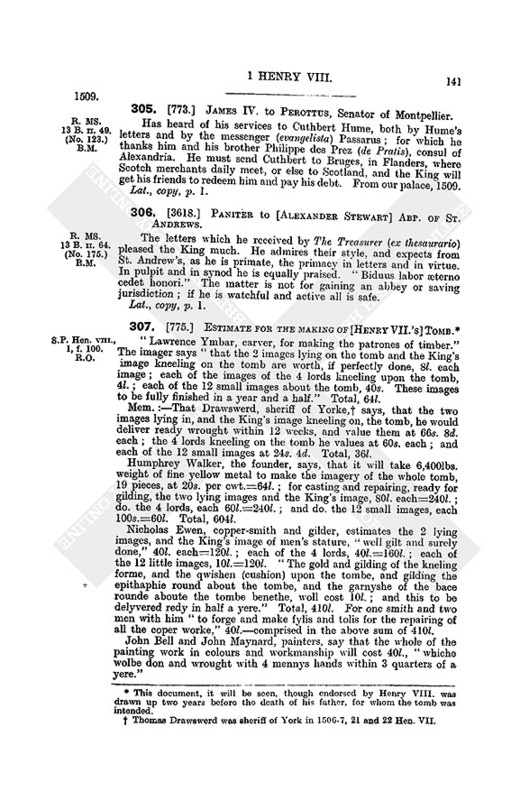 Edward III., grants of, g. 381 (22, 27, 42, 624, 66, 68, 713, 79, 857, 923, 1047), 414 (8, 1720, 224, 27, 36, 402, 49, 50, 57, 636, 701, 745), 447 (7, 10, 16, 22, 2830, 32), 449 (7, 8), 485 (11, 124, 17, 225, 2730, 447, 49, 50, 546), 519 (3, 4, 19, 289, 35, 38, 40, 45, 53, 65), 546 (9, 10, 12, 14, 15, 22, 46), 563 (3), 587 (3), 604 (3, 19, 38, 45), 632 (134, 27, 29, 34, 36, 38, 44, 49, 589, 76), 682 (12, 15, 18, 28, 312, 43), 709 (4, 8, 112, 21, 289, 50), 731 (4), 749 (324), 750 (810), 784 (15, 32, 40, 43), 833 (7, 17, 23, 38), 885 (2), 969 (14, 57, 73), 1003 (3), 1083 (445), 1123 (27, 33, 42, 48), 1221 (13, 31, 57), 1266 (2, 11, 28, 37), 1316 (18, 23), 1462 (24), 1494 (1, 26, 434, 50, 61), 1732 (3), 1804 (24), 1836 (11), 2617 (39), 2861 (1), 3049 (32), 3408 (30), 3499 (64). Edward, Prince of Wales, son of Edward III., grants of, g. 784 (15), 1462 (24), 3499 (64). Edward IV., 1101, 3185:g. 749 (23), 833 (67), 2222 (5), 2484 (1), 3499 (19). -, -, grants of, 386:g. 381 (7, 22, 42, 5865, 678, 70, 72, 79, 812, 856, 923, 969, 103, 1057), 414 (6, 8, 16, 17, 19, 20, 224, 28, 34, 37, 39, 403, 45, 49, 50, 57, 634, 66, 71, 75), 447 (7, 10, 16, 22, 289, 30), 449 (7, 8, 16), 485 (11, 16, 17, 212, 245, 279, 30, 39, 456, 49, 50, 55), 519 (3, 4, 19, 29, 35, 38, 40, 45, 53), 546 (9, 1115, 456, 52), 563 (22), 587 (3), 604 (3, 19, 378), 632 (14, 29, 36, 59, 62, 77), 682 (15, 18, 28, 312, 43), 709 (4, 8, 12, 21, 29, 40, 47), 731 (4, 9, 15), 749 (323), 750 (810), 784 (15, 312, 41, 43), 804 (32), 833 (7), 857 (12), 885 (2), 924 (30), 969 (14, 58, 70), 1003 (3), 1083 (22, 445, 47, 50), 1123 (323, 42), 1221 (55, 57), 1266 (1, 2, 11), 1316 (18), 1415 (20), 1494 (1, 26, 44, 50), 1602 (28), 1662 (29), 1732 (3), 1948 (25), 2861 (1), 3049 (32), 3499 (57, 64). Edward, son of Edward IV., afterwards Edward V., charter of, g. 784 (15). Edward, son of George duke of Clarence. See Warwick, Earl of. Edward, the sackbut. See Johannes, E.
Edward, Adam son of, charter of, g. 485 (25). Edward, Th., 438 (3 m. 31). Edwardis, Wolseys and Keyrs, in Little Canfield, Essex, g. 289 (12). Edwards (Edwardis), David, scholar, g. 546 (39), 2964 (52). -, - (Edwardes, Edwardis), Hugh, 20 (p. 14), 3313 (6):g. 132 (59), 289 (20), 651 (2), 885 (11), 2055 (43), 2964 (52, 75). -, - (Edwardys, Edwarde), James, 438 (4 m. 10). -, - (Edwardes, Edwardis), John, 20 (p. 17), 82 (p. 39):g. 54 (92), 485 (40), 731 (17), 1123 (17), 1732 (31), 2964 (52). -, - (Edwardes), Ric., 438 (1 m. 18). -, - (Edwardis), Th., g. 3499 (61). -, - (Edwardes), Wm., 20 (p. 16), 82 (p. 40), 2480 (63, 66), 2575 ii.:App. 9:g. 381 (1), 447 (19), 485 (40), 924 (11). -, - (Edwardys), Wm., clk., notary, 3101, 3142, 3146, 3176:g. 1415 (16), 1948 (88). Edwardston (Hedwardstowne), Suff., 438 (3 m. 12). Egerton, Kent, 438 (3 m. 15). Egerton, Hugh, 438 (4 m. 3):g. 1948 (99). -, -, John, 438 (4 m. 3):p. 1543:g. 132 (103), 969 (23). -, - (Eggerton), Ralph or Sir Ralph, gentleman usher, King's standard bearer (2 Jan. 1514), knighted at Tournay, 20 (p. 13), 82 (p. 42), 2053 (1, 2, 3, 5, 6 i., ii. ), 2295, 2301, 2480 (67), 2702:App. 9:g. 94 (14), 257 (65), 485 (9), 651 (24), 784 (8), 924 (28), 1365 (25), 1462 (12), 1524 (13), 2617 (1, 20), 2684 (45), 2861 (33). -, - (Eggerton), Randolph, 438 (3 m. 17). -, - (Eggerton), Wm., 438 (2 m. 24), 2392:g. 1565 (14). Eggerley, Rob. See Notes and Errata, 2137. Eggesford (Engenesford, Eggenefford, Eggisford, Eggynefford), Devon, 438 (1 m. 11), 438 (2 m. 12). Eggington (Egkingdon, Ekyndon), Beds, 438 (4 m. 14). Eggleston (Egleston), Dham., 438 (4 m. 22). Egham, Surr., 438 (2 m. 8), 438 (3 m. 6):g. 2222 (14). Eglesfeld or Eglisfeld, John, 438 (4 m. 4):g. 190 (15), 3499 (31). -, - (Eggelsfeld, Ecclesfeld, Egylsfeld), Lawrence, clerk of the check of the Guard, 1015, 2023, 3373, 3426, 3554:g. 709 (1), 833 (15), 2055 (44). -, -, Rob., 2315 (2):g. 1462 (32). -, -, Th., g. 1083 (49). Egleston, John, 20 (p. 17), 82 (p. 39). Eglintoun, Hugh Montgomerie, earl of, 2461. Egmanton, Notts, 438 (1 mm. 3, 5). Egmanton, John, 438 (4 m. 7). -, - (Emangton), Rob., 438 (4 m. 7). Egmond, M. de, 2187. See also Ysselstein. Egramonte or Egramownt. See Grammont. Egremont (Egremond), Cumb., 438 (2 m. 28). Egton, Yorks, 438 (2 m. 9). -, -, Sultan of [Khansuweh el Ghuri], 191, 7667, 795 (2), 1002, 1974 (p. 895), 3586. See also Abu' Nasr. -, -, -, his nephew, 191. -, -, -, French and Venetian envoys to, 1002. Eifionydd (Yenneth) commote, co. Caernarvon, 438 (1 m. 19). Eland (Heland), Rob., 438 (4 m. 25). Elberd or Elbert, Henry, 1803 (2 m. 5). Elcombe (Elcom) [in Wroughton], Wilts, g. 357 (15), 885 (10), 1221 (23). Elderton, Edw., gentleman usher, 20 (p. 15). -, -, Sir John, 1493 iii. -, -, Th., 438 (4 m. 28), 3137 (6, 9, 14, 15):pp. 151920, 1549. -, -, -, letter to, 2546 iii. -, -, -, his accounts, 25467. -, -, Wm. See Elrington. Eleanor, Queen of Edward I, grant by, g. 632 (58). Eleanor (Leonora), sister of Charles Prince of Castile, 2867, 2963. -, -, proposed marriage to the Duke of Lorraine, 545. -, -, proposed marriage to Louis XII., 2710, 27434, 2868, 2945, 3009, 3018 (p. 1302), 3145, 3210 (p. 1361). -, -, proposed marriage to the Duke of Gueldres, 3174. Elesham, Worc., 438 (4 m. 6). Evesham? Elfael or Elvael (Elvell, Ellewell, Ellevell) lordship, co. Radnor, 1803 (1 m. 3):g. 54 (24), 519 (51), 1524 (46), 1732 (9), 1804 (1), 3324 (45). Elford, Staff., 438 (2 mm. 4, 31), 438 (4 m. 26). Elham, Kent, vicar of, 438 (2 m. 6). Eliano, Ludovico, French ambassador to Hungary, 463. Eling, Hants, 438 (2 m. 23):g. 833 (69). Eliot or Elliott. See Elyot. Elistrige, in Scotland, p. 1260. Elizabeth [Woodville], Queen of Edward IV. ( 1492), 438 (3 m. 13):g. 784 (11). -, -, -, mother of King Edward, 825. See Notes and Errata. -, - [Plantagenet], daughter of the preceding, Queen of Henry VII., mother of Henry VIII. ( 1503), 438 (4 m. 11), 1429:g. 257 (23), 709 (44), 784 (11), 885 (7), 1316 (11), 3324 (8, 12, 14, 36, 39), 3499 (59). Ella (Elley, Euella), or Kirk Ella, Yorks, vicar of, 438 (4 m. 8). Elland (Eland), Yorks, 438 (4 m. 5). Ellerker, John, g. 158 (91). -, - (Elderkare, Ellarcar, Ellercar, Illerker, Helerker, Ellerkyre), Sir Ralph, 20 (p. 17), 438 (1 m. 9), 725, 837, 1363, 2740:p. 1547 bis:g. 94 (63), 804 (29 iv., ix. ), 833 (45 iii. ), 1365 (3). -, -, -, receipt by, 837 ii. -, -, -, his sons, 725. -, - (Ellerkar, Ellercar, Elderkar), Ralph or Sir Ralph, the younger, ship captain, 182, 1414, 2304 (3), 2305 ii., iii., 2652, 2686, 2740, 2842, 2938:p. 1519. -, -, -, knighted after Flodden, 2246 (4 ii.). -, - (Eldorkar, Eldicar, Eldircar, Ellercar), Wm., ship captain, 1661 (1, 3, 4 bis), 1869 iii., 2304 (3), 2652, 2686, 2722, 2842, 2938:p. 1519. Ellerlek, Westmld., 438 (3 m. 28). Ellerton, Salop, 438 (3 m. 28). Ellerton, Yorks, 438 (1 m. 12). Ellerton [on Derwent], (Elreton), Yorks priory, 438 (3 m. 15). -, -, -, prior. See Mathewe, H.
Ellesborough (Ellysburgh, Ellesburgh), Bucks, 438 (1 mm. 10, 16), 438 (3 m. 29):g. 2137 (5). Ellesmere, Salop, 438 (2 mm. 28, 31). Ellester, dean of, i.e. of Glasgow See Forman, R.
Ellevell or Ellewel lordship. See Elfael. Ellingham (Elingham), Hants, 438 (2 m. 8). Ellingham, North (Northelingham), Norf., 438 (4 m. 25). Ellington (Elyngham), Nthld., g. 485 (26), 2863 (5). -, -, vicar of, 438 (3 m. 8). Elliot (Ellot), Master, slain at Flodden, 2313n. -, - See also Elyott. Ellis, Alan son of, grant by, g. 158 (32). Ellis or Elys, Alfred, g. 2772 (24). -, -, Henry, 1803 (2 m. 4). -, - (Elyes, Elyse, Elysse), John, 438 (2 m. 32), 653, 1803 (1 m. 6):g. 1805 (2). -, - (Glys), John, abbot of Newham, p. 1531. -, -, Rob., 82 (p. 39), 707 (p. 383):g. 1083 (46). -, -, Roger, 20 (p. 18), 82 (p. 39). -, -, Stephen, clk., g. 833 (41). -, - (Elyse), Th., vicar of Shorne, g. 1462 (25). -, -, Wm., p. 1541:g. 833 (58 i.). Elmartour, in Scotland, p. 1260. Elmerie, lord of. See Aymeries. Elmham (Elmyngham), Suff., g. 2684 (12). Elmham, North, Norf., g. 731 (50). Elmley (Elmele, Elmeley), Kent [in Sheppey], 438 (3 m. 11):g. 3107 (23). Elmley (Elmeley), Worc., g. 1524 (47). -, -, college, warden of, 438 (2 m. 25). Elmley (Elmeley) Castle, Worc., barony of, g. 1804 (25). -, -, chapel of, g. 485 (32). Elmley Lovet, Worc., g. 94 (13), 257 (86). Elmore, Glouc., 438 (4 m. 5). Elmsall, North (Northelmesall), Yorks, 438 (2 m. 24), 438 (4 m. 9). Elmstead (Elmested), Kent, 438 (1 m. 8), 438 (3 m. 24). Elphabrough (Helflabourgh, Elfarnburgh), Yorks [in Sowerby], 438 (4 m. 5), 1803 (1 m. 2). Elphin diocese, pp. 1523, 1529. -, -, George, bp. of, 747. Elphinstone (Elweston), Alex. lord, slain at Flodden, 1379, 2246 (4), 2313. -, - (Elphraston, Elphiston), Alex., clk., a Scot, pp. 1521, 1523. -, - (Elphiston), Rob., clk., a Scot, p. 1523. -, -, Wm., bp. of Aberdeen ( 25 Oct. 1514), 212, 2420, 2443, 2461, 2793, 2911, 2973, 3119, 3122, 3390. Elrington, Edward, g. 218 (35). -, - (Erlington), Rob., 438 (4 m. 18):p. 1541. -, - (Elderton, Eldyrton), Wm., 1803 (1 m. 1). Else or Elsey, Th., 20 (p. 19), 82 (p. 43). Elsenham, Essex, 438 (2 m. 12). Elsham, Linc., priory of, 438 (2 m. 10). -, -, -, prior. See Martin, J.
Elsing, Norf., 438 (2 m. 4), 438 (3 mm. 5 bis, 20). Elslack (Elslake), Yorks, 438 (1 m. 3). Elson (Eleson), Wm., p. 1547:g. 132 (26, 32), 158 (91), 1123 (37), 2222 (16 Yorks), 3408 (16). Elston, letter dated at, 1118. Elstow (Elnestowe) nunnery, Beds, confirmation for, g. 485 (54). Elstree (Idelstre), Herts, g. 158 (3). Elsworth (Ellysworth), Camb., 1803 (1 m. 2). -, -, rector of, 438 (1 m. 15 ? "Elford"). Elsy, John, ship master, 2938 ii. Eltham, Kent, and Horne Park, 438 (1 m. 6), 1434, 1453 ix., 2337, 2925, 2929 (2), 3018, 3024n., 3248, 3268, 3416, 3423:App. 26:g. 414 (2), 587 (2), 784 (28), 1123 (50), 1732 (42), 3324 (35). -, -, letters dated at, 248, 792, 796, 798, 994, 28778, 28856, 2943, 2949, 2965, 29712, 2992, 3036, 30556, 3070, 30745, 3078, 3086, 3350, 3379, 33801, 3393. -, -, grants dated at, g. 132 (99, 118), 158 (4, 5, 12), 257 (84), 289 (16, 17), 357 (36), 804 (23, 42, 46), 833 (5, 64), 969 (11), 1044 (8), 1462 (1, 3, 4, 6, 9, 12, 29, 38), 1732 (12), 2617 (22), 2964 (223, 256, 334, 402, 49, 578, 69, 70), 3049 (5, 21, 25, 33, 37, 42), 3107 (26, 289, 35, 46, 48, 50), 3226 (7, 13, 16, 25), 3324 (7), 3408 (17, 23, 27, 32, 35, 389, 41), 3499 (1, 18). -, -, chaplain of, g. 357 (39), 1602 (5, 33). Elties, Th., of the Staple, 634. Eltisley (Eltesle), Camb., g. 1266 (22). Eltoft (Eltoftes), Chr., 438 (4 m. 13). Elton (Ayleton, Aylton), Notts, 438 (2 m. 25), 438 (4 mm. 19, 22). Elton, Edward alias Baker, scholar of Oxford, g. 3107 (41). Elveden, Henry, 438 (3 m. 18). -, -, Nic., g. 2684 (10, 11). Elvenden, Oxon, 438 (4 m. 27). Elvetham, Hants, 438 (4 m. 13). Elvington (Elrington), Yorks, 438 (2 m. 33):g. 190 (15), 563 (10), 3499 (31). -, -, Wm., p. 1520. Elwold, John, 438 (4 m. 12). Elwyn, Th., 438 (4 m. 9). Ely (Dely), Camb., 438 (1 m. 21), 438 (2 mm. 6, 15), 438 (3 m. 32), 438 (4 mm. 7, 11, 12):g. 11 (10), 2055 (52). -, -, cathedral priory, g. 546 (15), 1415 (2). -, -, -, confirmation for, g. 519 (3). -, -, -, Robert prior of, 1493 ii. -, -, hospital of St. John, p. 1529. Ely, Nigel bp. of (11331169), and Hugh bp. of (12291254), and Herveus, bp. 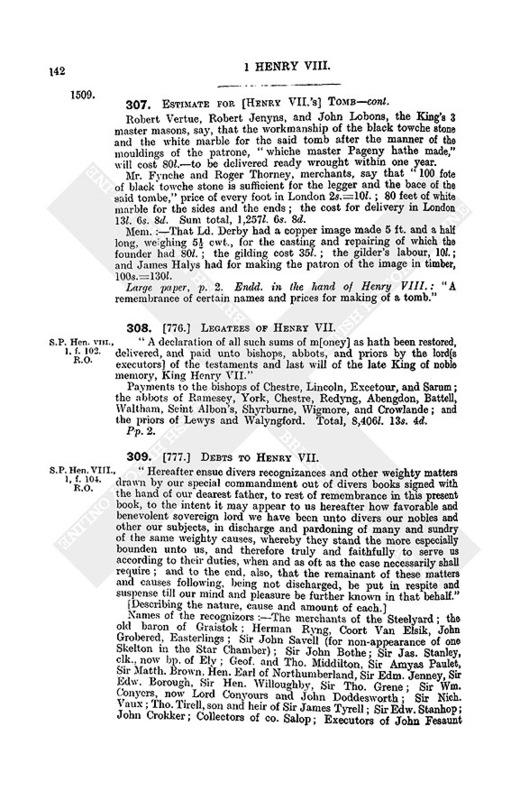 of (11091131), charters of, g. 546 (15). -, -, bp. of. See Stanley, J. -, -, bpric. and diocese of, 137, 438 (2 m. 21), 438 (4 m. 19). Ely, Isle of, Camb., 438 (1 mm. 2, 15). Ely, Ric., 438 (3 m. 9). Elyn, John, purser, 2305 iii., 3148. Elyngbrigge, Anne, d. and h. of Thomas, g. 449 (5). -, -, John, g. 449 (5). -, -, Joan widow of Thomas, 1803 (m. 1). 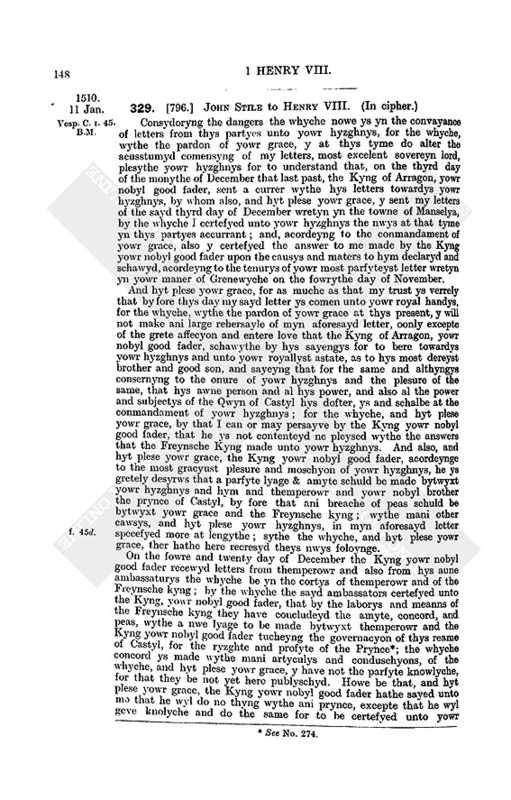 Elynor, Th., g. 1732 (31). 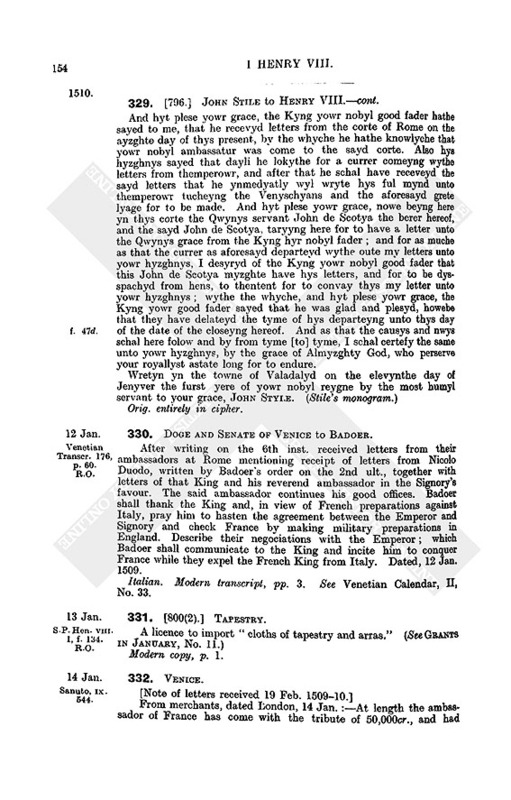 Elyott (Eliott), Hugh, 874 (2), 1262 (p. 578):g. 1804 (54), 3324 (7). -, -, John, 438 (4 m. 1):g. 485 (40), 2684 (66). -, -, Ric., 438 (3 m. 27). -, - (Elyatt, Elyet, Elliott, Eliot), Ric., King's serjeant at law, justice of C.P., 82 (p. 39), 205 (p. 106), 438 (2 m. 20), 963, 2787, 3464 (2):pp. 15337, 1542 bis, 1543, 1546:g. 11 (9), 54 (49), 94 (50), 132 (57), 519 (50), 804 (36), 833 (2), 924 (23), 1083 (8), 1316 (3, 14), 1662 (1, 28), 1836 (14), 2055 (114), 2137 (11), 2684 (41, 50, 62), 3107 (34), 3499 (71). -, -, -, made justice of C.P., g. 1836 (14). -, - (Eliot), Rob., 20 (p. 19), 82 (p. 40):g. 414 (14). -, - (Eliot), Robert, clk., 438 (3 m. 2). -, - (Eliot), Th., 438 (4 mm. 10 bis, 16):g. 1266 (267). -, -, Th., justice of assizes, g. 804 (36), 833 (2), 1083 (8), 1316 (3, 14), 1662 (1, 28), 2055 (114), 2137 (11), 2684 (62), 3107 (34). -, - (Eliot, Eleot), Wm., 438 (4 m. 28). -, -, Wm., clk., 438 (2 m. 20). Elys or Elyse. See Ellis. Elysworthy, John, 1803 (2 m. 3). Emanuel King of Portugal, 23, 37, 171, 329 (p. 149), 345, 442, 504, 795 (2), 797 (2), 1215, 1326 (p. 618), 1974, 2031, 2801, 2823, 3586. -, -, -, letters from, 171, 1974. -, -, -, letters to, 504, 2823, 3236. -, -, -, his marriages, 23. -, -, -, chosen K.G., 442. Embleton (Emyldon), Nthld., g. 485 (26), 2863 (5). Emborough (Enborough), Soms., 438 (1 m. 13). Emden (Embden), Edzard count of, lieutenant of East Friesland, 2857, 3153, 3365, 3456, 3572. -, -, cathedral, p. 1530. Emnesley or Emmesley. See Hensley. Emneth, Norf., 438 (1 m. 13), 438 (2 m. 27). Emondhilles [in Norhamshire], Nthld., 1803 (1 m. 4). Empingham, Rutl., 438 (3 m. 18). Empire, the, and its princes and electors, 83, 130, 430, 547, 610, 866, 1252, 1306, 1309, 1383, 1386, 1428, 1438, 1440, 1469, 2028, 2040, 2095 ii., 2169, 2294 (2), 2448, 2572 (p. 1127), 26001, 2925, 2957, 3139, 3151, 3237, 3365, 3400, 3456, 3519. -, -, Papal envoy to. See Areniti, C.
Emps, James, a captain of German mercenaries, 1071. Empson or Emson, John, 438 (4 m. 7). -, -, Richard, Henry VII. 's chancellor of the duchy of Lancaster, his daughter, wife of Edward Greville, 388. -, -, -, recognizances made to, g. 54 (3), 94 (99), 132 (18, 34), 218 (59), 289 (6), 357 (10), 381 (108), 414 (46), 485 (42), 651 (7, 32), 682 (3), 784 (56), 804 (6), 3499 (41). -, -, -, reversal of attainder, g. 1602 (11). -, -, -, trial of, p. 1548. -, -, -, other references, 1, 131, 341, 388, 1473:g. 11 (10), 54 (64), 132 (115), 158 (42), 218 (13, 24), 257 (32), 289 (5), 357 (43), 519 (61), 587 (10), 632 (72), 709 (14, 24, 36, 61), 751 (6), 804 (28), 833 (70), 969 (21, 38, 56), 1083 (41), 1172 (10), 1316 (4, 15), 1462 (37), 1602 (11), 1948 (31, 85), 2861 (8), 3408 (28). -, -, Th., 438 (3 m. 21), 14713, 1803 (1 m. 6):p. 1541:g. 1732 (49), 2861 (7). -, - (Emson), Thomas, son of Sir Richard, p. 1548:g. 1602 (11). -, -, -, restoration in blood (Act), 14712. Enderby, Leic., g. 381 (31, 33), 2330 (4). Enderby, Anne widow of John, 438 (4 m. 12). -, -, Eleanor d. and h. of John, g. 833 (31). -, -, Eleanor, widow of Sir Richard, 438 (3 m. 5). -, -, Sir Richard, 438 (2 m. 8). Endergill, Th., 1262 (p. 578). Enfeld, John, g. 1316 (22). Enfield (Enfeld, Enfyle, Envilde, Envile), Midd., 438 (3 m. 19), 438 (4 m. 11):p. 1512:g. 651 (20), 2055 (130). -, -, grants dated at, g. 190 (8, 9, 16, 18, 22, 24, 289), 218 (2), 682 (26, 42), 709 (1). -, -, letters dated at, 3168:App. 3. Engeham, John, p. 1539:g. 132 (33), 969 (23), 2222 (16 Kent). Enghien (Angien), in Hainault, 1469. Enghien, Sieur d', 3051 (? "Dysenghien"). Englefield (Ingilfeld, Inglefelde, Inglesfeld), Sir Thomas, 20 (p. 19), 81, 313, 341, 1493, 2067n., 2163, 2269:pp. 1533, 15378, 1542, 1546:App. 21:g. 94 (43), 257 (80), 414 (53), 546 (68), 731 (278), 1732 (2), 2055 (37), 2330 (4). -, -, -, signature of, 313, 555, 596, 602, 845, 1247, 1221, 2243:g. 132 (65), 158 (90), 190 (25, 35, 41), 218 (33), 257 (85), 414 (48, 52), 448 (4, 8), 519 (5), 604 (256, 44), 632 (35), 731 (7, 20, 52), 749 (3, 16), 784 (14, 16, 56), 804 (49), 1003 (15), 1123 (45), 1316 (367), 1524 (16, 47), 2330 (3). -, -, -, chosen speaker of the House of Commons, 341. -, - (Inglefeld), Th., p. 1533. English (Inglus), Henry, g. 2055 (95 iii.). 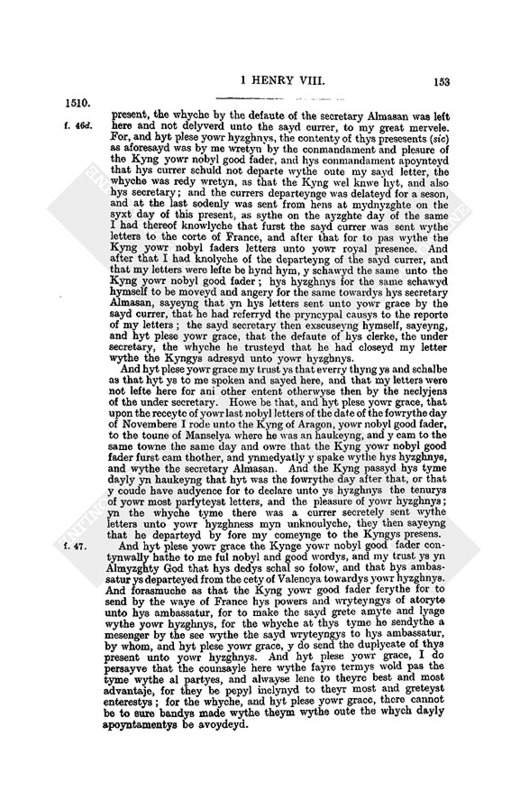 -, - (Ynglyssh), John, King's player, 20 (p. 16). -, - (Inglysshe, Englysshe), Michael, merchant of the Staple, 438 (3 m. 4), 1032 (2). -, - (Hyngelych), Roger, gunner, 20 (p. 14), 311. -, - (Inglys), Th. (temp. Hen. IV. ), g. 2055 (14). -, -, Th., 438 (4 m. 24). -, - (Ynglysshe, Englysshe), Th., serjeant of the Poultry, collector of the King's rents in Calais, 20 (pp. 18, 19), 82 (p. 40), 193 (pp. 99, 100), 438 (4 mm. 6, 15), 878:g. 158 (28), 449 (14 bis), 604 (5). -, -, -, letter from, 878. Enkhuysen (Inckehusen, Enchusen, Henkhewes, Encusan), in Holland, 2009, 2809. Ennsishaim (Enghessen), in Alsace, letter dated at, 621. Ensham (Eyvesham, Egnesham) abbey, Oxon, 438 (1 m. 24). -, -, abbot. See Salley, M.
Epinoi (Espignoy), Sieur d', 446. Epperstone (Helpeston), Notts, g. 833 (17). Epping (Heppyng), Essex, 438 (1 m. 10). Epping Hills, Essex, g. 1221 (36). Epsom (Ebbisham), Surr., 438 (1 m. 21). Epworth (Ippworth, Epweth), Linc., 438 (4 m. 6), 1803 (1 m. 3):g. 2484 (2). -, -, rector of, p. 1529. Erard, Wm., g. 1083 (14). Erasmus (Herasmus), , ship master, 1661 (4). -, -, Desiderius, letters from, 652, 736, 745, 790, 8478, 863, 865, 883, 8901, 905, 920, 922, 926, 936, 958, 961, 968, 972, 980, 1050, 10523, 1060, 11667, 1188, 1477, 15468, 1550, 1552, 2088, 21334, 2191, 2223, 2306, 241719, 2424, 2433, 2458, 2468, 2519, 2558, 2610, 2625, 2724, 28478, 30445, 30624, 3214. -, -, -, letters to, 501, 91, 771, 882, 911, 917, 933, 935, 9489, 952, 964, 967, 973, 996, 1082, 1122, 1139, 1200, 2457, 2626, 2818, 2855, 3374. -, -, -, other references, 212n., 2224:App. 5. Erbaston, Sir Alex., App. 26. Erbury or Eibury, Suff., g. 94 (35). Erdescote, Berks, g. 2684 (1). Erdeswyke, Sampson, brother and heir of Hugh, g. 632 (31). Eresby (Erisby), Linc., 1803 (2 m. 4). Ergile or Ergyle. See Argyle. Eridge (Ewregge), Suss., 438 (3 m. 1). Erisey (Grysy), Cornw. [in Grade], 438 (4 m. 16). 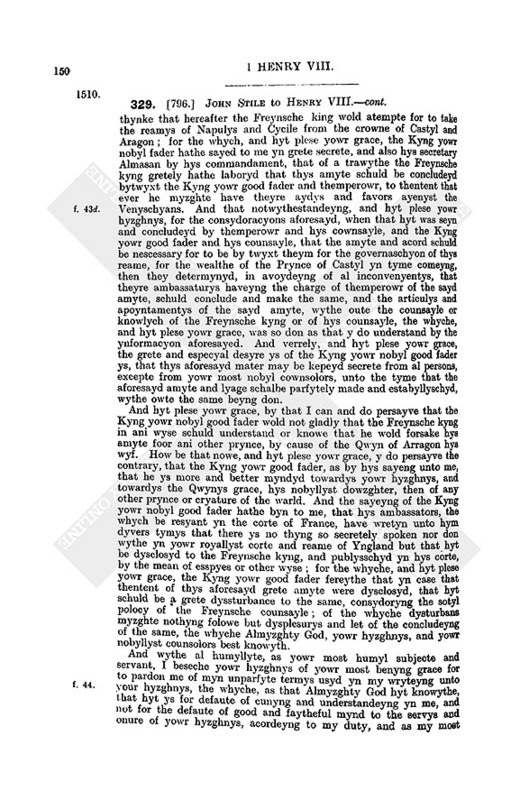 Erisey (Grysy, Gresy, Grese, Eryse, Erysy, Eresey, Heresy), James, 438 (4 m. 16):p. 1535:g. 833 (58 iii. ), 969 (23), 1494 (9), 3324 (24). -, - (Grysy), Th., 438 (4 m. 16). Eriswell (Eswell, Erswell, Ersewell, Ereswell), Suff., 438 (1 m. 2), 438 (3 m. 13):g. 546 (17). Erith (Ereth), Kent, and naval storehouse there, 438 (1 m. 12), 438 (3 m. 2), 2546, 2904, 3085, 3137 (1, 6, 9, 15), 3318, 3382, 3513, 3526, 3566:pp. 1506, 1519:g. 94 (35 p. 50), 2617 (12). Erliche (Elflyth), John, p. 1534:g. 1221 (21), 2772 (39). Ermington (Armyngton), Davon, 438 (3 m. 25). Erneys, Wm., 438 (3 m. 17). Ernley or Erneley, John, King's attorney, 20 (p. 16), 82 (p. 39), 205 (p. 106), 214, 963, 1661 (p. 752), 2574, 2787, 3464 (2):pp. 1535, 1541, 15456, 1547 ter:g. 11 (9), 54 (88), 94 (36), 132 (51), 289 (6), 519 (60), 546 (1), 651 (7), 709 (26, 34), 804 (28), 833 (2), 1083 (16, 24, 39, 46 iii. ), 1266 (34, 41), 1316 (4), 1602 (41), 1662 (5), 2055 (93, 114), 2222 (16 Suss. ), 2484 (27), 2684 (68), 3049 (35), 3107 (55). -, -, -, signature of, g. 54 (88), 218 (4, 538), 257 (4, 5, 85), 632 (35), 709 (22), 1494 (14). -, -, John, nephew of the preceding, 2574. Ernulfiberia (i.e. St. Neots, Hunts), 438 (4 m. 10). Erpingham, Norf., g. 969 (30). Erroll (Eroll, Arroll), Wm. Hay, 4th earl of, constable of Scotland, slain at Flodden, 1294, 2246 (1, 4), 2313. -, -, William Hay, 5th earl of (1513), 2461. Errona, Francis de, Spanish merchant, 1463 v.
Erskine (Askill), Lord, slain at Flodden, 2246 (4), 2313. -, -, John lord (1513), 2461. -, -, John, and Sir John, the younger, of Dun, inventories of their property, 2165. Eryholme (Eryham, Erryham), Yorks, 438 (1 m. 6). Eryngfeld, Sir Th., p. 1535. Grenville? Escheators, appointments, 1221 (53):g. 1494 (18, 37, 55, 60), 2484 (17), 2617 (17), 2684 (39, 63), 3499 (28, 33, 56, 68). -, -, Act touching, 341. Escourte, Walter, 438 (2 m. 15). Escreke, John, g. 257 (19). Esher (Assher, Ayssher), Surr., 438 (2 m. 7), 3409. -, -, grants dated at, g. 158 (80, 84, 89), 190 (7, 11, 12, 14), 604 (10, 13, 14), 3324 (13, 14). -, -, letter dated at, 2811. Esholt (Asshold), Yorks, g. 1221 (8). Eshton (Essheton), Yorks, 438 (1 m. 3). Esk, the Border river, p. 1260. Eskdale Muir, in Scotland, 2406. Eslingen (Estlynge), in Germany, 1993. Eslington, Nthld., 438 (2 m. 29). Esquier, Eliz., prioress of Sinningthwaite, 438 (4 m. 25). Esquivel (Desquirvell), Alonzo de, servant to Katharine of Aragon, 82, 127. Essendine (Esyngden), Rutl., g. 132 (49). Essex, 205 (p. 106), 438 (2 m. 20), 438 (4 mm. 4, 5), 2054, 3223:g. 218 (32), 381 (74), 632 (26), 682 (4), 833 (11), 969 (23), 1044 (18), 1365 (24), 1462 (38), 1494 (9, 55), 1602 (19, 38), 1662 (46), 1804 (8), 1836 (6), 2222 (12, 16), 2484 (9, 17), 2684 (87), 2964 (81), 3324 (20), 3408 (18), 3499 (12). -, -, commission of the peace, p. 15367. -, -, de-afforested part of, confirmation for, g. 381 (58). -, -, feodary of, g. 94 (35 p. 50). -, -, forest of, g. 604 (48). See also Waltham Forest. Essex, archdeacon of, 438 (3 m. 7). See Rawson, R.
-, -, countess of, 82 (p. 41). -, -, Henry Bourchier earl of ( 1483), g. 2772 (4). -, -, Henry Bourchier, earl of, K.G., captain of the King's spears, 20 (pp. 12, 19, 201), 37, 205, 438 (3 m. 24), 442, 707, 953, 1453, 1803 (2 m. 5), 2053 (1, 2, 5, 6 ii., iii. ), 2391 (pp. 10589), 2480 (13), 2929, 3146, 3464, 3483:pp. 1536, 1538:App. 9:g. 857 (5), 1044 (18), 1170 (7), 1172 (7), 1415 (11), 1804 (36), 2055 (23), 2684 (49), 3049 (20), 3499 (47). -, -, -, signature of, g. 2055 (23), 2684 (49). Essex, Eliz., widow of Thomas, 438 (2 m. 23). -, -, Henry de, constable (temp. Hen. II. ), g. 2964 (67). -, -, Wm., or Sir Wm., esquire for the Body, knighted at Tournay, 20 (p. 15), 438 (4 m. 8), 1176 (1 iii., 2), 2301, 2480 (48), 2575 ii., 3348 (3):p. 1534:g. 257 (49), 784 (38), 2222 (16 Berks). Estaynes ad Montem. See Easton, Great. Estbarholt or Estbarfold. See Bergholt. Estcourte, Joan, Agnes, Margaret, Eliz. and Walter, g. 3226 (11). Este, in Italy, 3270 ii., 3396. -, -, letter dated at, 2080. Este, Alfonzo d', duke of Ferrara, q.v. -, -, Card. d'. See Ferrara. Esterfeld, Harry, g. 2964 (2). -, -, John, 438 (4 m. 5). 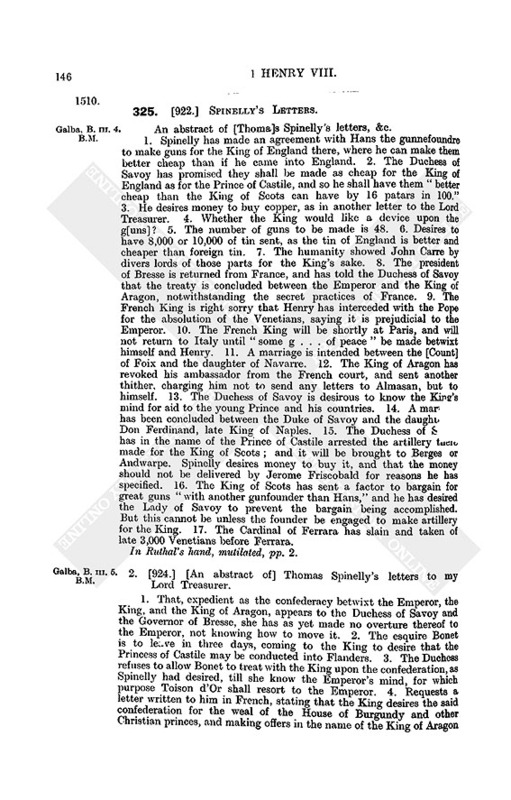 -, -, John, King's chaplain, canon of Windsor and Bridgenorth, 20 (p. 13), 438 (2 m. 5):p. 1526:g. 2137 (22). -, -, John, merchant of Bristol, 438 (2 m. 5), 438 (3 m. 15). -, - (Esterveld), Scolastica, 438 (4 m. 10). Esterford [in Coggeshall], Essex, 2765. Esthorp, Essex. See East Thorpe. Esthorpe, Yorks, g. 158 (32). Estlete, Westlete, &c. in Lowestoft, q.v. Estmond, Ric., clk., 438 (1 m. 23). Estning, Suff., 438 (4 m. 7). 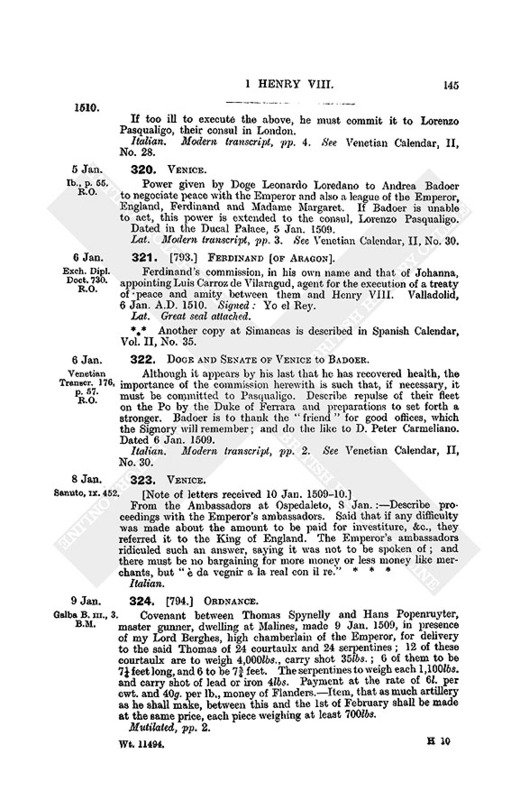 Estrada, Ferdinand duke of ("Farnando Duke"), 6 (p. 5), 162 (p. 87). Estreke, John, g. 1494 (40). Estrige, in Scotland, p. 1260. Estynam, Dors., 438 (1 m. 3). 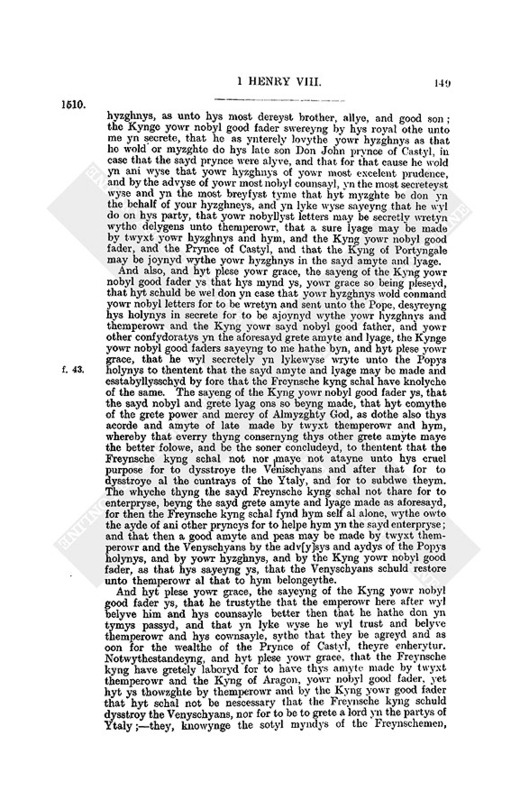 Esyngton, Wm., p. 1538:g. 709 (30). Etal (Edall, Etell), Nthld., 438 (2 m. 15), 2246, 2284, 2381, 2386. Etampes (Temps, Estampes, Estempes), in France, 3191. -, -, letters dated at, 192930, 32012, 3230, 32323, 3239, 3244. Etaples, Treaty of (A.D. 1492), 257 (13), 2957. Etchells (Echels), Chesh., g. 485 (9). Ethelbald (thelbald), King of the Mercians, grant of, g. 381 (79). Ethelred (Atheldred), King [the Unready], grants of, g. 381 (73), 519 (53), 682 (12). Etherdwick (Etherwyk), Yorks, 1803 (2 m. 3). Eton, Bucks, 438 (3 mm. 29, 32), 1803 (1 m. 4). -, -, college of, g. 485 (34). -, -, -, provost. See Lupton, R.
-, -, Wm. See Eyton. -, -, Wm., purser, 3148. Etton, Ntht., 1803 (1 m. 5). Etton, Anne, g. 381 (16), 1494 (5). -, -, Eliz., d. of Miles, 438 (3 m. 2). -, -, Sir John, 438 (3 m. 2). -, -, John, App. 22:g. 381 (16). Etwall (Etwell), Derb., 438 (2 m. 30), 1803 (1 m. 4). Etwell, John, merchant of the Staple, 1032 (2). Etyngdon or Etyngton. See Eatington. Eu (Heu), in France, 12, 1835. Eudes, Th., g. 546 (2). Eustace (Ewstace), Edw., 20 (p. 19), 82 (p. 40). Euston, Suff., 438 (3 m. 17). Evelyn, Clays, gunner, g. 2684 (26). Evenlode (Emlode), Worc., 438 (2 m. 30). -, -, Henry, secretary to the earl of Surrey, 2008 (2). -, -, Henry, teller of the Exchequer, 2829. -, -, John, 1803 (1 m. 1):g. 3226 (11). -, -, Th., 438 (2 m. 18). -, -, Wm., 438 (3 m. 30). Everdon (Ewerdown), Ntht., 438 (3 m. 5). Everdon, Alice, widow of Thomas, 438 (4 m. 16). Everingham, Yorks, 438 (2 m. 7):p. 1547. See also Constable, Marm. Everingham alias Elveringham. See under Calais. Everingham, Edmund, 1803 (2 m. 4), 2392 (p. 1063). -, -, Henry, g. 804 (29 vi., xi. ), 833 (50 iii. ), 1365 (3). -, -, Sir John, 1363:p. 1547:g. 804 (29 vi., xi. ), 833 (50 iii. ), 1172 (7), 1365 (3), 1415 (11), 1494 (9), 2772 (24). -, -, John, g. 1003 (20). Everley (Everleigh), Wilts, 436, 438 (2 m. 24):g. 969 (38). Evers, George, notary public, 438 (2 mm. 32, 34). -, - (Eure, Ivers), Sir Ralph, deputy of Berwick, 290, 438 (2 m. 15), 837 ii., 1493 ii., 2096, 2651, 2713, 2740:p. 1547 bis:g. 257 (88), 632 (26), 3499 (78). -, -, -, letter from, 2096. -, - (Eure), Ralph, g. 3499 (78). -, - (Eure), Sir Wm., 438 (2 m. 15). -, -, Sir Wm., knighted at Tournay, 2301, 2480 (57):App. 9. Eversaw, Bucks, St. Nicholas chapel, g. 1316 (15). Everton, Notts, 438 (2 m. 11). Everton, Humphrey, g. 190 (4), 604 (35), 2055 (95). -, -, John, g. 2964 (52). Evesham, Worc., 438 (1 mm. 7, 13, 16, 23), 438 (4 m. 6 ? "Elesham"), 1803 (2 m. 3). -, -, abbey, 438 (4 m. 4), 3315:g. 749 (11). -, -, -, confirmation for, g. 485 (46). -, -, -, abbot of. See Newbold, T.; Lichfield, C.
-, -, -, election of abbot, g. 2535 (20, 24), 2617 (23), 2684 (22). Evesham, Ric., monk, g. 2684 (22). Evington (Evyngdon), Leic., 520:g. 546 (27), 632 (64). Evington, Wm., g. 857 (14). Evrard brother of the Marquis. See Grey, Lord Edward. Evyas (Eveas), Alex., 438 (3 m. 11):g. 3107 (23). -, -, Humphrey, g. 3107 (23). -, -, John, g. 3107 (23). Ewe and Lovayne, lord of, 438 (3 m. 24). Ewell, Surr., 438 (2 m. 34), 1803 (2 m. 6). Ewelme (Newelme), Oxon, 438 (1 mm. 8, 12):g. 54 (55), 1172 (3), 2055 (50). -, -, master of the hunt, g. 94 (51), 682 (8). -, -, rector of, p. 1527. -, -, rector presented, g. 2055 (97). -, -, Th., g. 485 (59). Ewenny priory, co. Glamorgan, g. 604 (49). Ewer, Th., mariner, 2304 (5). Ewes (Ewse), the Scottish river, p. 1260. Ewes (Ewse) Doores, in Scotland, p. 1260. Ewhurst (Eweherst), Surr., 438 (2 m. 22):g. 709 (32). -, -, lands (named) in, g. 924 (33). Ewhurst (Iwehurst, Uherst), Suss., 438 (2 m. 21), 1803 (1 m. 3). Ewias (Ewyslande, Ewyasland), Heref., 438 (2 m. 33). Ewias Lacy (Eweslacy), Heref., lordship of, g. 54 (23), 132 (52), 519 (51). Exbridge, Devon, 438 (1 m. 5). Exbrigge, Rob., 438 (2 m. 10). Exchequer, the, 456, 78, 82 (p. 39). 168, 217, 251, 438 (2 mm. 212), 438 (3 mm. 1, 7), 438 (4 m. 13), 683, 704, 877 (2), 1463, 1715, 1752, 1819, 2431, 2829, 2903, 3032:g. 11 (1), 132 (45), 804 (42), 1524 (15, 18), 1836 (7), 1836 (30), 1948 (60, 63), 2684 (53), 3324 (39). -, -, chamberlains of. See Talbot, G.
-, -, chancellor of, g. 2964 (53). See Lovell, Sir T.
-, -, chief baron, g. 1602 (7). See Hody, W.; Scott, J. -, -, clerk of the Pipe, g. 1836 (17). -, -, Declaration of state of the Treasury, 180, 1407. -, -, delivery of records. See Records. -, -, engrosser of the great roll, g. 1415 (24). -, -, fourth baron, g. 1948 (28). See Denny, E.
-, -, King's remembrancer, g. 804 (42). -, -, treasurer of, g. 132 (98), 2772 (4). See Surrey, earl of. -, -, treasurer's remembrancer, g. 1602 (13). Exe, the Devonshire river, g. 132 (57), 749 (19), 1083 (2). Exemption from serving on juries, taking office, &c., g. 94 (7), 357 (16), 447 (3), 485 (10), 519 (16), 546 (3, 48), 563 (16), 651 (12, 35), 682 (2, 19), 731 (42), 784 (13, 20), 804 (22), 833 (68), 1266 (14), 1662 (12), 1804 (21, 47), 2484 (8), 2964 (39, 61), 3324 (2), 3408 (13), 3582 (18). Exemption from tolls, &c., g. 158 (33), 357 (46), 1221 (3), 2964 (55). Exeter (Excetour), 438 (1 mm. 5, 9, 11, 12), 438 (2 mm. 7, 9, 11 bis, 13, 16, 21, 32), 438 (3 mm. 3, 9, 11, 17, 18 bis, 21, 23, 256, 31 bis), 438 (4 mm. 10, 12, 14, 17, 21 bis), 874 (2), 1661 (4), 1801, 1803 (2 m. 2), 1852, 1864, 1982 (4), 2109, 2763 (2), 3313 (3, 6):pp. 1518, 1520:g. 833 (11), 924 (23), 969 (4), 1083 (2), 1948 (2). -, -, confirmation for, g. 381 (22). -, -, customs and port of, g. 94 (21), 132 (101), 381 (100), 969 (66), 1170 (9), 2222 (4), 3049 (40). -, -, mayor, &c., of, 438 (3 m. 2):g. 132 (57). -, -, merchant of the Staple of, 438 (1 m. 12). -, -, tailors' company, confirmation for, g. 485 (39). -, All Saints, g. 1083 (2). -, Cathedral, 438 (3 mm. 15, 22, 31, 34), 438 (4 mm. 12, 15). -, -, confirmation of charters, g. 381 (73). -, -, dean of, 438 (3 m. 10):p. 1531:g. 2222 (16 Devon). -, -, election of dean, 229. -, -, vicars choral, 438 (1 m. 11), 438 (4 m. 15). -, gaol of, keeper, 438 (3 m. 3). -, hospital of St. John Baptist, 438 (2 m. 5). -, -, master. See Hill, R.
-, St. Edmund's on the Bridge, rector of, p. 1532. -, St. George's, rector presented, g. 289 (33). -, St. Katharine's nunnery, confirmation for, g. 414 (5). -, St. Mary's chapel, in the castle, g. 1083 (2). -, St. Thomas in Cowyk, 438 (4 m. 22). -, West Gate, 438 (4 m. 22):g. 94 (37). -, -, bailiff of Westgate alias Ex Iland, g. 749 (19). Exeter, bp. of. See Oldham, H.
-, -, John de Grandison bp. of (13271369), charter of, g. 485 (50). -, -, bishopric of, 438 (4 m. 15). -, -, -, confirmation for, g. 682 (12). Exeter, duchy of, "Exeter lands," g. 132 (13), 158 (2), 381 (18), 414 (21), 1123 (26), 3049 (41), 3408 (24). Exeter (Excetur), Th., monk of Gloucester, 2489. Exhall (Oxhull, Oxshulff), Warw., 438 (1 m. 12). -, -, rector of, 438 (1 m. 14). Exmewe, Th., 438 (3 mm. 10, 34):g. 1083 (24). Exminster (Exmystre), Devon, g. 218 (28), 604 (11), 749 (22), 1083 (2). Exmoor (Exmore) Forest, Devon and Soms., g. 94 (35). Exmouth, Devon, g. 2222 (4). Exton (Hexston), Staff., 438 (2 m. 8):g. 969 (47). Exwill (Exilond), Devon, g. 1083 (2). Eydon, Ntht., g. 257 (32). Eye, Suff., 438 (4 m. 19):g. 2055 (50). 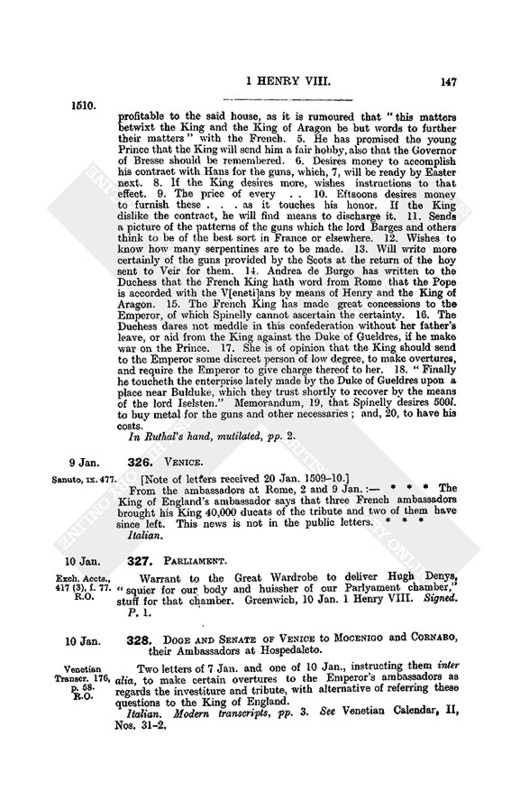 -, -, constable of castle, &c., g. 190 (9). -, -, honor of, g. 190 (9), 709 (27), 2055 (95). -, -, priory, confirmation for, g. 546 (35). Eyland, Rob., g. 2484 (17). Eyman or Eyeman, Wm., 1803 (2 m. 6). Eynesford (Aynysforde), Kent, 438 (1 m. 5). Eynesham monastery, Oxon, g. 924 (17). 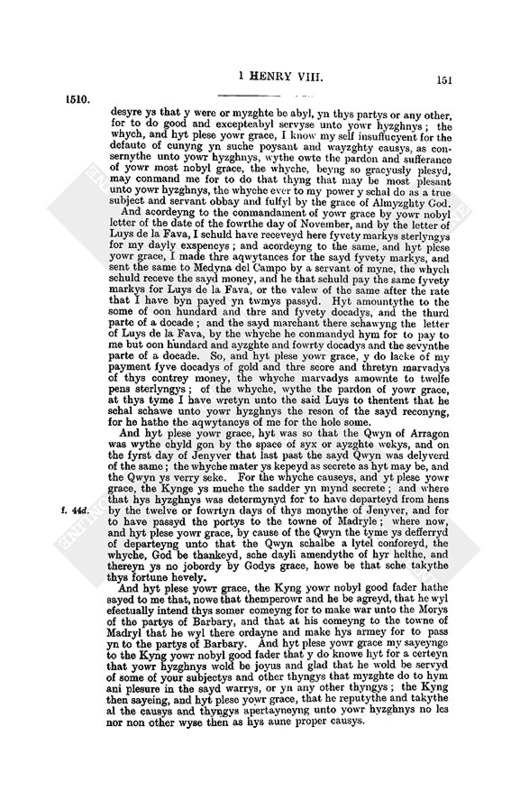 Eyre (Heyr, Eyr), Arthur, 438 (1 m. 8), 2392 (p. 1063). -, -, Eliz., widow of William, 438 (2 m. 9). -, - (Eire), John, 438 (3 m. 17). -, -, Ric., g. 132 (26), 1221 (41). -, -, Rob., 438 (1 m. 8). -, - (Eyer), Roger, 1803 (2 m. 6):g. 2222 (16 Derb.). -, - (Eyr, Ayer), Th., 2392 (p. 1063):g. 2055 (95). Eyton, Beds. See Eaton Bray. Eyton, Ntht., g. 2330 (4). Eyton [Yorks ? ], g. 3499 (78). Eyton upon the Wild Moors, Salop, g. 2535 (22). Eyton (Eton, Heydon), John, 438 (3 m. 30). -, -, Margaret, 438 (3 m. 16). -, -, Owen, 2480 (61). -, -, Ric., clk., keeper of Tong college, 438 (2 m. 8). -, -, Th., g. 2535 (22). -, - (Eton, Heyton), Wm., 438 (3 m. 16):g. 3408 (14). Eztuiga, Juan de, provincial of Aragon, 3524.